Club Penguin Cheats by Mimo777 Club Penguin Cheats by Mimo777: Club Penguin Earth Day And Mine Renovations News! 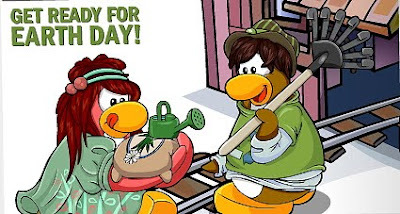 Club Penguin Earth Day And Mine Renovations News! Just like I said, Club Penguin will be celebrating Earth Day on April 22nd! Many penguins feel the Mine is the one place on the island that needs some improvements. Gary the Gadget Guy thinks a recycling center would be a great addition and has agreed to make some inventions that can make new things out of old things! Of course, this means there would be lots of work from all penguins! So Earth Day? Hmm, what do you think? Do we like that? I think they should have a mud volleyball game at the Earth day party! Play Fragger! Best. Game. Ever! ah the Mine is a bit shabby. Cant wait to fix it. Look on page A5 the plant is floating! I think that the non-member's should have a special green item too, I think that was mentioned in an older post. I saw that member's had an item already, which one it was I forgot, but non-members deserve something too! And by that I mean something new, not an old item. Us older non-members haven't had a decent new item in ages. I hope there will be a new mine shack!!! The current one is soooooooo drab! Who's with me? Yer they seriously should have mud vollyball game there where the ice rink is that would be fun! Great guess, Thats what im thinking too mimo! Um, that's pretty cool, but why do they have this party and not an Easter, St. Patrick's Day, and a Christmas? Oh, excuse me, they did have one and it was called a "HOLIDAY" Party. I really wish they wouldn't try to offend people, because what I've read from you guys is that just removing those first two parties really offends people. We like these parties, they're what makes Club Penguin amazing and cool! Well, that and the anticipation for the next mission, but when will THAT come out? Anyway, I'll look out for that Earth Day Party. Yay, Earth Day. I love earth day, I am just decorating a perfect recycled igloo!!! I think this is awsome! But Mimo....when herbert left in the latest mission didn't he drop seeds? birthday is in 9 days! Happy birthday to me! lol. Sounds awesome! I can't wait!! I'm glad the Mine is going to be improved. It's not exactly my favorite place on CP. 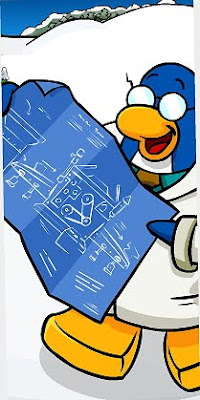 I'm also wondering what the Club Penguin team has in store for the Earth Day Party! Why is cp getting like all earth friendly??? Mimo post about the pink puffle rescue cheats please there are tons of them there is a golden back hidden on every level. Don't believe me? Level 4: grab 2nd puffle and look for the purple arrow. the funny thing is in our science class we have to make a machine out of recycled stuff! Yeah the mine is a bit boring... I can't wait for Earth Day but how come they do stuff like that but not St. Patricks & Easter!?!?! i like the mine... but i guess it COULD use some ronovations. Oh really like you haven't had a new free item in ages? Heres two the reporter hat and the puffle party hat. i heard there was a green face paint and iv'e looked all over the island but i cant find it. Do you know where it is? Hey mimo, If you look at the post thats named "april sneak peak" you see a switch that is hooked up to a machine....A recycling machine maybe. It's hidden in the catalog at the gift shop. Just move your mouse over anything in the background. If the hand appears on your cursor, click. Hope this helps!!! Tootsville is having an epic free VIT Membership event thanks to the mayor! Hi! Yeah, im thinking the same thing! And please dont put "CPG MOD" after your name when you arent modding! Thanks! JOIN CLUB PENGUIN GREEN TEAM! CLICK MY NAME! THANKS! Um, no you werent the first to comment. In Mimo's rules for the blog he says not to say something like "First Comment". Ok, so thanks! Hi! I hope its the new mission and the seeds have something to do with it! And please dont put "CPG MOD" after your name when you arent modding! Thanks! I cant wait either! Its going to be fun! And please dont put "CPG MOD" after your name when you arent modding. Thanks! HAPPY EARLY BIRTHDAY!! I hope to see you at the party! Yeah! The mud volleyball sounds fun! Please dont put "CPG MOD" after your name when you arent modding! Thanks and see you at the party! thats going to be so much fun! way to be positive about Earth Day! i know a lot of people are mad about these parties but not everybody celebrates these holidays. club penguin should be open to everyone just just people who believe in certain things. club penguin is trying to include everyone not just people from the USA or Christians. hope this helps! 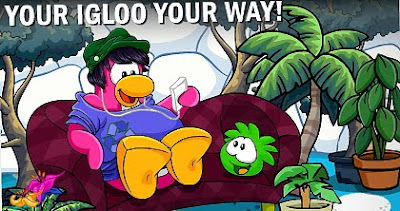 club penguin wants everybody to be green. this isnt a bad thing at all! everybody should be green and save our planet! lol sry im not mimo but its in the catalog! go to the 4th page and click on the pink square in the bottom left corner! hope you can find it! 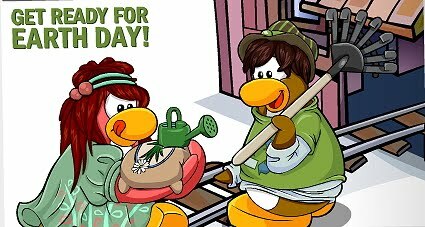 obviously, Herbert is trying to plant the seeds to grow an O-Berry bush and try to kidnap the puffles, thus ruining CP because everything revolves around the puffles. He'll probably try to turn them into his mindless slaves or something like that. Lets hope its good and not boringly fast. See i think the reason CP doesn't do that is because members pay from 5.95 to 59.95 to become a member. That is why there are member rooms. I'm sorry for the problem. Maybe you should contact CP. Cool! I thought they would make a recycling machine sometime! And i'm glad they are making the mine better! Please just put CPG MOD when you are modding. Thank You. Please just put CPG MOD when you are modding. To find the face paint go to the clothing catalogue and click on the purple bit of the dance floor. Spycomic, I know that the new misson will have something to do with that. I was trying to be nice. And interpreted what you said "ovbiously" as being sort of mean. Next time please dont say that. Thanks! CP is getting earth friendly maybe to warn us about Global warming.They want us to realize that we need to save the planet. If we dont start acting now there will be nothing left to save in the future. And to all those who want holiday parties instead of earth day parties, this is what i have to say. You anyways celebrate holiday parties at home. Do you ever think about the earth? I guess not. But now at least club penguin is helping us to think of the earth. Yeah! Your right! Just the fact that Earth is already past its tipping point... we will go into a Warm Age, we can slow it down! But sadly, we cant stop it now. Its to late. Poor Earth! What is the point if u realy want to save the planet get of the computer! the party is gonna get loads of people online using electricity and destroying the earth. Club Penguin Medieval Construction and Loo Tunes! Club Penguin You Decide Party Item! Club Penguin Garden Reviewed By You! New Club Penguin Mission 11 Sneak Peek! Club Penguin Herbert's Revenge Game Trailer! Club Penguin Pin Cheat - LEAF PIN! Club Penguin Environmental Reviewed By You! Recycle Your Club Penguin Mail! Club Penguin Series 8 Treasure Book Cheats! Club Penguin Earth Day Sneak Peek! MIMO CLUB PENGUIN Quickee Party Tonight! This Weeks Herbert's Revenge Sneak Peek! New Club Penguin Room, Path & Garden! Club Penguin PINS are IN THE GAME! Club Penguin "Green" Reviewed By You! Mimo's Secret Hiding Spot Revealed! Club Penguin Mission 11 Sneak Peek! Club Penguin Pin Cheat - FROG Pin! Mimo's Secret Club Penguin Hangout Spot Revealed! Club Penguin Gang on the iPad! Club Penguin Exploring Reviewed By You! Club Penguin April Sneak Peek! More Club Penguin April Fools Party Sweetness! New Mimo Fan Club Register NOW! Club Penguin Times Silly News!